Dentistry is founded on the principle of prevention. All patients are recommended biannual cleanings and examinations. The hygienists at Chevy Chase Dental Center are able to preform in-depth cleaning services as well as fluoride treatments and any action that is needed to prevent or reverse the spread of periodontal disease. Contact us today if you have any questions regarding our hygiene services. The dentists at Chevy Chase Dental Center can now take digital impressions and scans of a patient’s teeth, design the crown using advanced computer software, and manufacture it using an in-office high precision milling machine. These crowns are made from high-quality dental ceramic, and matched to the patient’s natural tooth color. Thanks to the Planmeca PlanScan system there is no more temporary crowns or multiple return visits. Dental crowns are a type of dental restorative and when cemented into place, fully covers the portion of the tooth. Since dental crowns encase the entire visible aspect of a tooth, the dental crown in effect becomes the tooth’s new outer surface. Named for the way that they say “bridge” the gaps between teeth lost to trauma or decay, bridges restore your smile’s health and beauty by placing durable artificial teeth where your natural teeth are missing. If your missing teeth make you feel self-conscious and if you are noticing problems with speaking or chewing, Chevy Chase Dental Center has the solution for you. Created and only able to be removed by your dentist, bridges offer a comfortable , semi-permanent option that can enhance your smile and improve the health of your natural teeth. Made from a thin but highly durable material, veneers are used to re-create the look of natural teeth while also providing resilience comparable to natural tooth enamel. Veneers can turn chipped, stained or crooked teeth into a beautiful, straight, gleaming white smile virtually overnight. Customizable to any tooth shade you desire, veneers are a long-lasting way to create a natural-looking smile. A root canal is a treatment to repair and save a severely damaged or infected tooth. The procedure involves removing the damaged area of the tooth (the pulp), cleaning and disinfecting it and then filling and sealing it. The common causes affecting the pulp are a cracked tooth, a deep cavity, repeated dental treatment to the tooth or trauma. The term “root canal” comes from cleaning of the canals inside the tooth’s root. Our Dentists at Chevy Chase Dental, make every effort to preserve your natural teeth. However, if you’ve lost all your natural teeth whether from periodontal disease, injury or tooth decay, you are able to replace those missing teeth with dentures. Dentures can help fill our your face and profile as well as making you eat and speak better. When there is too much damage for a tooth to be repaired, the tooth may need to be extracted. Thanks to our doctors at Chevy Chase Dental, today’s modern procedures and follow up care, will guarantee your benefit and comfort. The days when tooth trauma and cavities were being treated with unsightly metal fillings are long gone. Today, modern tooth-colored fillings made of durable resin can be bonded to your teeth for a stronger, more natural-looking effect. Composite fillings are virtually undetectable and are used to prevent the spread of tooth decay and correct any cosmetic damage. A filling is one of the ways our dentists at Chevy Chase Dental Center can preserve your health. A dental implant mimics the form and function of a natural tooth, which consists of a root and a crown. Unlike fillings and crowns that are bonded to the tooth, dental implants are surgically implanted into the jawbone. After the implant is placed, an artificial, natural-looking tooth is attached to the implant. Over time, your bone and gum will fuse to the implant, providing extra stability and endurance for the patient. There are various ways to correct crooked or crowded teeth without the use of traditional braces. Invisalign uses a series of invisible and removable aligners that can be virtually undetected. This allows patients to smile more during treatment as well as after. Invisalign is made with a 3D computer imaging technology and is the most proven effective and invisible way to improve your smile. 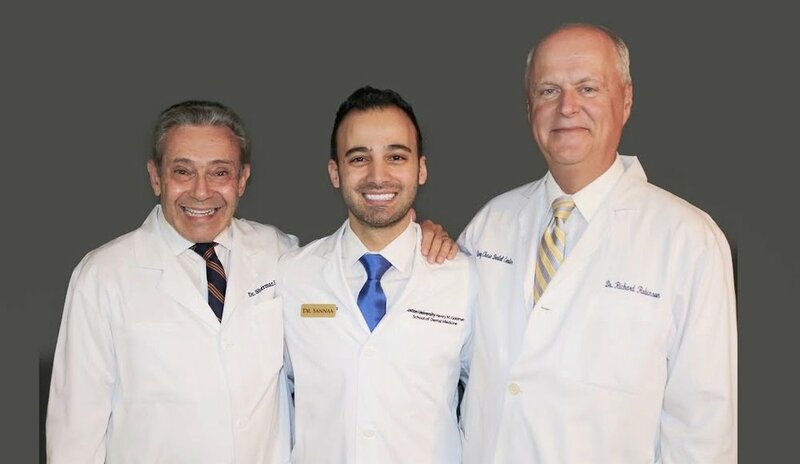 Our Periodontist Dr. Bita specializes in the diagnosis, prevention and treatment of Periodontal disease as well as the placement of dental implants. Dr. Bita offers a wide range of treatment options and can also treat patients with severe gum problems using a variety of surgical procedures. Dr. Bita has received extensive training in the areas of esthetic and functional crown lengthening, esthetic root coverage procedures, periodontal bone regeneration and pocket reduction surgery, minimally traumatic surgical extraction therapy with socket repair grafting, all aspects of simple through complex dental implant therapy, and the full scope of ridge and sinus grafting. This examination protocol has been developed by both dental and medical professionals. Early oral cancer is often painless and can go undetected without screenings. Our doctors at Chevy Chase Dental Center provide oral cancer screenings for every single patient during the exams and recall appointments. Our surgeon Dr. Bita also performs oral cancer screenings with localized biopsies if needed. Professional teeth whitening is faster, more effective, and longer lasting that treatments you find over the counter. To help restore your gleaming, white smile, we offer many options, such as custom whitening kits. Please contact us today to find out more about our whitening options and which one is best fit for you.